The undermentioned terms, conditions and statements do not affect your statutory rights as a consumer. All persons ordering alcohol from this web site must be 18 years of age or older. Also, we cannot sell to persons who may be purchasing alcohol for persons under 18 years of age. Bottle content sizes are highlighted within the product description. All goods are subject to availability. In the rare event of stock outs, we will advise you of the new delivery date. Other than Fine Wines and Vintage Ports, when current vintages run out, the following or next available vintage will be substitued automatically unless you advise otherwise at time of your order. Labels and packaging may vary at times, but the product will be per the normal specifications. The alternative will always be to a similar quality or better. At times product pictures may be out of date e.g. older vintage or label but the product will always match the description. All prices listed on this web-site are valid for online purchases only. All goods will be despatched within three working days for UK Mainland and 4-5 days for Non UK Mainland destinations. Please read Delivery Conditions for Non UK Mainland and for Rest of the World and this can vary during busy times such as Christmas and during severe weather conditions. Please ensure someone is available to receive the goods at the receiving address you have provided. 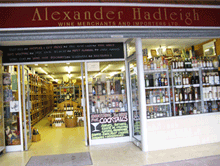 Alexander Hadleigh Wine and Spirit Merchants complies with all conditions of the Data Protection act of 1998.
or breakages reported immediately to the courier at the time of delivery. please then contact us before 16:00 the following day, if goods are broken or damaged. By following the above procedure, we can then resend the goods or offer full refund within 21 working days. We accept the following credit and debit cards on-line and when processing your payment please do not forget to include the 3 digit security code on the reverse of card. We do not accept American Express or Diners. All transactions on this site are secured by SAGE PAY. Simple, flexible, fully confidential Online Payment Service. The most recommended Payment Gateway Provider.